SMMS is a bilingual, multicultural school. It has a dual language program for grades Kinder to 4th grade (Pre-K 3 and 4 is a 90/10 Spanish program). Next year, the program will expand to 5thgrade, and so on, until it reaches 8thgrade and all grades are dual language. SMMS partners with Boston College and The University of Texas San Antonio to ensure a top-tier dual language program. 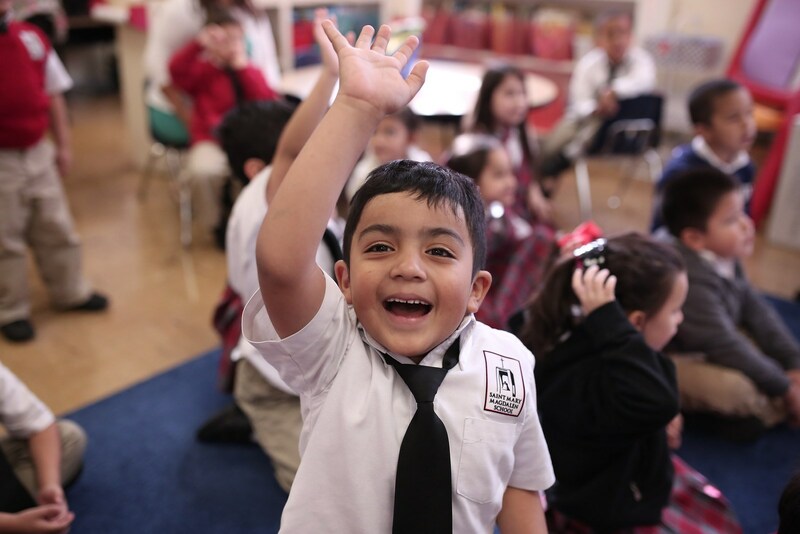 Our dual language program follows a 50/50 model focused on biliteracy development. This means that roughly half of instruction is in Spanish and half is in English. Languages are divided by content area. Math instruction is in English K-5th grade. All students, K-5th grade receive science and social studies in Spanish to help develop their Spanish literacy. At SMM, students also receive Religion in Spanish. This does not mean students will not learn math content in Spanish or science and social studies content in English. There are other opportunities throughout the day/week for children to learn vocabulary in both languages. It is important that children learn to read in their native language where their vocabulary is already established and where parents can continue to help them develop. Additionally, we know what children learn in one language will transfer to their second language. In other words, children only learn the process of reading once. Hence, the child’s first language determines the language of instruction for Language Arts. 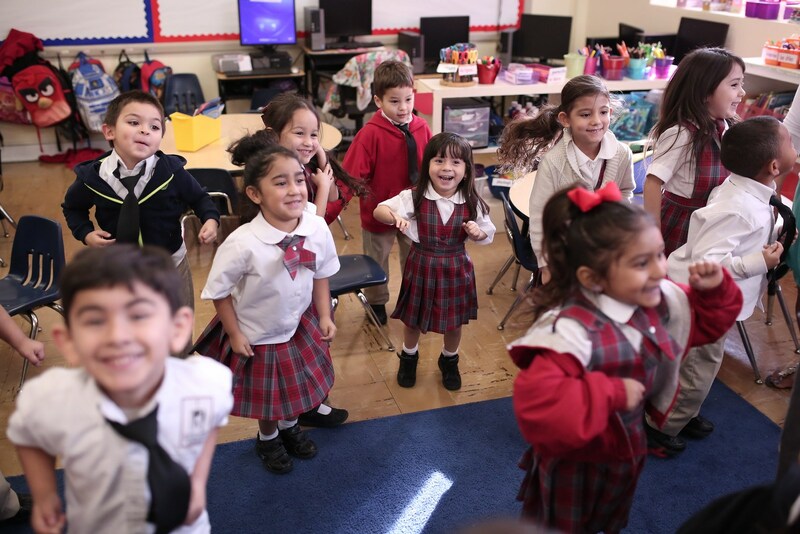 In Kindergarten and 1st grade, the student will be placed in Spanish Language Arts if the home language is Spanish, and in English Language Arts if the home language is English. Starting in 2nd grade, all students take two sections of Language Arts, one in Spanish and one in English, to continue their biliteracy development. My child is in X grade, but s/he has two teachers? I don't understand. Our teachers work together as dual language teams. Take 1st grade, with Mrs. T. and Mrs. M. Mrs. T, a fluent English speaker, teaches all her content in English. Mrs. M., a fluent Spanish speaker, teaches all her content in Spanish. So, let's say that I have a child whose first language is English and her homeroom teacher is Mrs. M. Notice first, that she was not simply placed with Mrs. Terry because she speaks English. This is because we want a mix of languages in each classroom to help children develop biliteracy. So, she would have English Language Arts and Math with Mrs. T., and Science, Social Studies and Religion with Mrs. M.
Let's flip it and say that my 1st grade daughter is Spanish dominant and her homeroom teacher is Mrs. T. Again, the language of the homeroom teacher and the language of the child has literally no connection; she was placed with Mrs. T. to balance the languages in the room. My Spanish dominant daughter would then have Spanish Language Arts, Science, Social Studies and Religion in Spanish, with Math and all her electives in English. What if my children falls behind academically since instruction is sometimes in a language s/he does not understand? This is a common and understandable concern with any dual language program. However, the concern is debunked by both academic research and data. Academic research (Collier & Thomas, 2009; Gómez, 2000; Alanís, 1999) has consistently pointed to better learning outcomes for students in dual language programs. This may seem counterintuitive: if we're decreasing instruction in English, how is it that kids in dual language programs outscore their monolingual peers in Englishwith regularity by 5th grade? The answer is that there are immense cognitive benefits to learning in English and Spanish; rather than imagining a brain where English and Spanish are fighting for space in the brain, imagine a brain where English and Spanish function almost as one, facilitating learning of each other. How is my child going to learn anything when he does not understand the teacher? Don't confuse understanding with learning! Just because you do not understand something does not mean that you are not learning amazingly. In fact, when you understand something completely, you are often notlearning, and when you are struggling to understand, your brain is in a full throttle learning process making connections where it can and striving to make meaning. Additionally, the model has several components designed as ‘safety nets’ to ensure children learn the content and language. For example, children are paired with a student who knows more language or content. That pairing works together to learn the material. We preach growth mindset and failure as keys to success. Our Gómez and Gómez model is a way to practice what we preach!